Running Press Adult, 9780762452460, 288pp. Rekindle the romance at home with a weekly date night, one on one, over an absolutely delicious meal for two. Simply carving out time to talk, cook, and eat together can be the relationship-booster you need to keep the spark alive. Just don't forget the cocktail (try a Rhubarb Sour or a Grapefruit 75). Make date night an integral part of your week and woo your partner all over again with food, drink, and sparkling conversation. 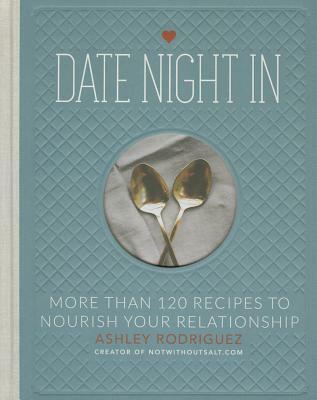 Packed with tantalizing and delicious recipes, Date Night In is a must-have cookbook for any couple who wants to spice things up with special seasonal meals at home around a table for two. Ashley Rodriguez is a Seattle-based food consultant, cooking instructor, food photographer, author of Date Night In, wife, and mother of three. As the creator of notwithoutsalt.com Ashley blogs about life as told through food. Her blog has earned accolades from Saveur.com (Best Food Blog 2013), Babble.com, Brides.com, BonAppetit.com, Glamour.com, Food52.com, MarthaStewart.com, RealSimple.com, TheKitchn.com, and the TimesOnline.com, and for her writing and original photography. Ashley's work has also been featured in several publications such as AllRecipes, Edible Seattle, Food and Wine, Glamour, Martha Stewart Living, the New York Times, and Sunset. Before she began writing, Ashley worked in several professional kitchens including Wolfgang Puck's Spago in Beverly Hills. Now, Ashley teaches in and around Seattle, and in her new storefront, the Not Without Salt Shop.